Coupons are used to provide discounts and special offers to customers. These coupons can be applied to a subscription at any time. 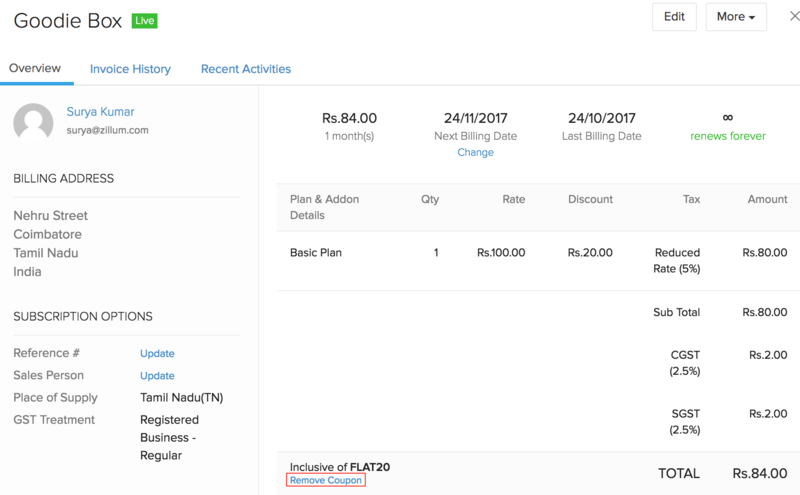 Below are some of the things that can help you how coupons work in Zoho Subscriptions. You can use the Coupon Operations section to know how you can perform operations like creating, editing, deleting and making a coupon inactive. The Coupon Fields section describes all the coupon fields. To create a coupon, please follow the below steps. Go to the Products tab and select the product for which a coupon is to be created. Click the Add Coupon button. Fill out the Add Coupon form with the required details and click Save. You can change the coupon’s name, postpone the expiry date of the coupon and update the Maximum Redemption field. To edit coupon details, please follow the below steps. Go to the Products tab and click Show details in the coupon to be edited. Click the Edit button to go to the Edit Coupon form. Make the required changes and click Save. A coupon can be made inactive if you do not want to apply it to new subscriptions but want subscriptions for which the coupon has already been applied to still make use of the coupon. To make a coupon inactive, go to the Products tab and click Mark as inactive on the required coupon. A coupon can be deleted only if it is not associated with any subscriptions. To delete a coupon, go to the Products tab and click Delete under the coupon to be deleted. There might be occasions where a coupon needs to be removed from a subscription. This can be achieved by manually removing the coupon from the subscription. Here’s how. Go to Subscriptions tab and click Overview. Choose the subscription from which the coupon has to be removed. Remove the coupon by clicking the ‘Remove Coupon’ option. The new coupon form looks like this. Coupons in Zoho Subscriptions are differentiated by their redemption type. Redemption Type refers to the number of times a coupon can be applied to a particular subscription. Coupons are of three redemption types. One Time can be chosen as the redemption type when a coupon is to be applied only once for a subscription. In other words, a coupon of one time redemption type can be used only once. Forever can be chosen as the redemption type when a coupon needs to be applied each time an invoice is raised for a subscription. Limited time coupon can be chosen as the redemption type when you want the coupon to be redeemed for a specific number of times per subscription. This coupon will be automatically removed from the subscription once it has been fully utilised. A coupon can be applied to either all plans and addons or specific plans and addons of your choice. Coupons are associated with plans and addons at the time of creation of a coupon. You cannot change this association once a coupon is created. However, you can create a new coupon and associate it with the plans and addons of your choice. You can use coupons to either offer a flat discount or a percentage discount. Flat - If a flat discount is chosen, the specified amount will be deducted from the invoice line item. Percentage - If a percentage discount is chosen, the discount will be deducted from the line item. Discounts will be deducted from the cost of each entity the coupon is associated with. On applying Flat10 coupon, $10 will be deducted from Plan 1 AND Addon 1. Note that the Flat10 coupon does not apply to Addon 2. This is because the coupon was associated only with Plan 1 and Addon 1 at the time of creation. A new coupon can be created and associated with Plan 1, Addon 1 and Addon 2 in case the discount has to be applied to Addon 2 as well. A coupon cannot be applied to new as well as existing subscriptions beyond this date. However, coupons with forever as the redemption type which are already applied to subscriptions can still be redeemed until they are manually removed. This refers to the maximum number of subscriptions a coupon can be used for. If Maximum Redemption is set to 2, the coupon cannot be applied to more than 2 subscriptions. 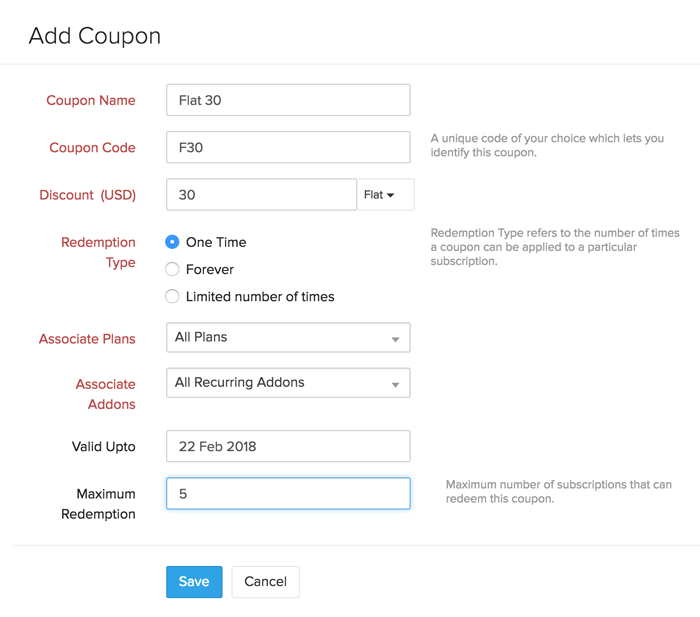 If there isn’t a value set for Maximum Redemption, the coupon can be used for any number of subscriptions. Umm.. Please enter a valid Email Id. We can wait. Take your time to draft us your feedback.